Many customers arrive at our website or call us after having considered a number of options for their oil slops treatment. The standard for treating this waste is still to try and de-water using some kind of chemistry or blend the waste with oil solids and process through an energy intensive, slow thermal type of process. The difference between de-watering oil slops waste and genuine treatment using the SAS-ES chemistry and process is fundamental and creates a completely new economy in waste management. De-watering only ever removes part of the water from the waste. At time this is very good quality water, however it concentrates the remaining water in a matrix consisting of solids, oil, chemicals and water. This resulting concentrated slurry or sludge is then very hard to treat. So, effectively removing part of the water has reduced the waste volume and now the remaining waste is much harder to process. Often landfill or thermal processing are the only realistic options available for this sludge. In order to landfill the waste in many cases the sludge has to be stabilized or fixed and this approach doubles (sometimes trebles) the total volume of the waste for transport and disposal. Thermal processing (often combined with drill cuttings) is energy intensive and slow. The SAS-ES process in comparison creates a three-way split between the oil, water and solids. This means oil is recovered with an economic value, all the water is recovered, and only dry solids remain for disposal to landfill or back to sea. Let us use a simple example to illustrate the possible difference in operations. There is 1,000 tons (or m3) of oil slops waste to be treated. This consists of 20% oil, 70% water and 10% solids. First they de-water the slops using standard de-watering chemistry. This creates a 50/50 split. The top half (500m3) is good quality, clear water. 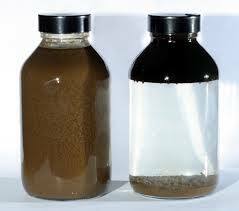 The bottom half consists of the remaining water (40%), oil (40%), chemicals and solids (20%). The clear water is discharged. The bottom sludge needs to go to landfill and requires stabilizing or fixing (choose your favourite material – sawdust, ash, etc.). We assume a 1:1 blend of sludge with fixing material. Now they have 1,000m3 of solid waste to go to landfill. When using the SAS-ES chemistry the original slop waste is dosed, and a three-way split is created. The water (70%) is discharged, the oil (20%) is recovered and re-used or sold and only the dry solids (10%) go to landfill. There is only 100m3 of solid waste to dispose of. An order of magnitude less compared to traditional de-watering chemistry. The oil has a value (let’s assume $300/m3) and 200m3 of oil equates to $60,000. If we assume transport and landfill is $100/m3 (I am sure you all know the figure locally and this of course varies hugely around the world, but we have to pick a number) the landfill costs for de-watering are 1,000m3 x $100 =$100,000. For the SAS-ES three-way split the landfill costs are 100m3 x $100 = $10,000. So, already we have a cost of $100,000 for de-watering and no recovered value. For the SAS-ES approach we have $10,000 disposal cost and $60,000 oil value recovered. This equates to a difference between de-watering and SAS-ES of $150,000 in favour of the SAS-ES approach. If this approach sounds like something you would be interested in, simply contact us today! We would be happy to hear from you.